Since the 1970s, publishers have brought to market seemingly limitless decks based, sometimes closely and sometimes loosely, on the RWS design (discussed previously). Some Tarotists call them clones; however, the term is misleading. Clones implies exact copies; these decks are variations on RWS  not copies. They have an important advantage over rarely used or one-of-a-kind decks: you can reference and adapt RWS resources, which are numerous. In addition, if you learn one, learning another frequently requires modest additional study at most. However, many are gimmicky and lack attractive art, depth, and traditional esoteric symbolism when compared to their forebear. Still, if you want a deck that is similar to RWS, you may wish to consider variations. Below are a few good ones that are based to a modest degree on the original. Each has attractive, evocative art, a following among experienced Tarotists, and at least one book written specifically for it. Their depth and esoteric content, however, vary. 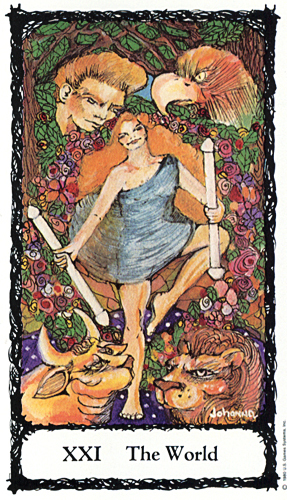 The Hanson-Roberts Tarot Deck (U.S. Games Systems, ISBN 0880790792), drawn by Mary Hanson-Roberts (who also drew the previously discussed Universal Waite Tarot) is generally cheerful and colorful, frequently emphasizing pastel hues and delicate shading (see illustration, right). However, some users may find it sacharine and the persons too young and/or unattractively doll-like. The deck contains little esoteric symbolism. Cards measure approximately 2 3/8 x 4 inches; titles are in English, French, German, Italian, and Spanish. You may also purchase the deck bundled with a companion book, Tarot Unveiled: The Method To Its Magic, by Laura E. Clarson (U.S. Games Systems, ISBN 0880794151). To view more cards from the deck, click here. 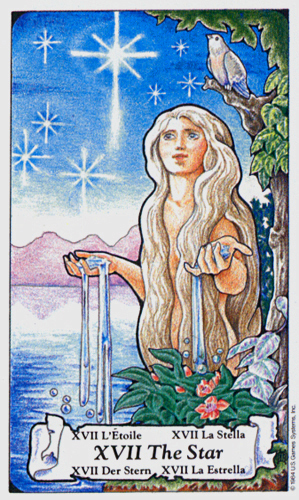 Illustration (above): The Star from The Hanson-Roberts Tarot (copyright © 1984 U.S. Games Systems). Click the image for a larger one. The Morgan-Greer Tarot Deck (U.S. Games Systems, ISBN 0913866911), illustrated by Bill Greer under the direction of Lloyd Morgan, has bold, strong, simply drawn images with rich, saturated colors (see illustration, left). The people depicted are often  but not always  young. Although the cards have modest esoteric symbolism, including color symbolism, it is sometimes inconsistently used. You may also obtain The Book of Tarot: Companion to the Morgan-Greer Deck, by Susan Gerulskis-Estes, alone (U.S. Games Systems, ISBN 0880792779) or bundled with the deck (U.S. Games Systems, ISBN088079593X). To view more cards from the deck, click here. 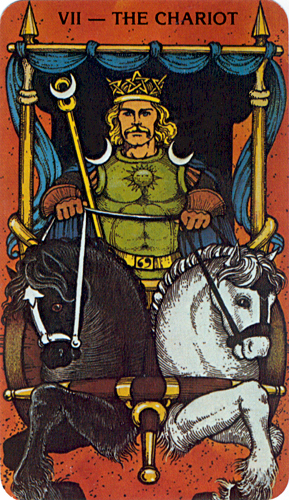 Illustration (above): The Chariot from The Morgan Greer Tarot (copyright © 1979 U.S. Games Systems). Click the image for a larger one. The Robin Wood Tarot (Llewellyn, ISBN 0875428940) by Robin Wood, is generally well drawn with convincing details and exuberant, bright colors (see illustration, right). The deck contains little traditional esoteric and minimal Christian symbolism. Instead, it frequently reflects Woods religious orientation: Wicca (contemporary witchcraft as a religion). Most of the persons depicted are young, model-perfect, and frequently blond, which some users may or may not like. Cards measure approximately 4 3/4 x 4 5/8 inches. The deck comes with the full-sized companion, The Robin Wood Tarot: The Book, also by Wood. To view more cards from the deck, click here. 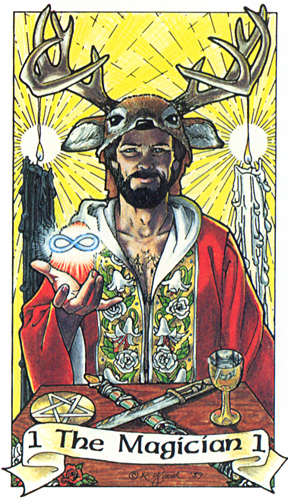 Illustration (above): The Magician from The Robin Wood Tarot (copyright © 1991 Wood). Click the image for a larger one. The Sacred Rose Tarot Deck (U.S. Games Systems, ISBN 0880790121) by Johanna Gargiulo-Sherman, has rich, sometimes dark, colors. The cards frequently have luxurious natural settings, including star-filled skies, lush forests, and luminous roses (see illustration, left). Although the deck probably departs from its forbear more than others reviewed here, it essentially remains a variation on RWS. Although it frequently has a pagan look, it has modest Christian content. Sacred Rose probably contains more traditional esoteric symbolism than other variations discussed here. Some cards are especially grim and persons usually have mask-like faces, which some users may or may not like. The author uses a unique system for associating the cards with astrology; however, the associations do not appear as astrological symbols on the cards. Justice is numbered VIII; and Strength, XI. Card backs are not reversible. You may also obtain Guide to the Sacred Rose Tarot (U.S. Games systems, ISBN 1572812184), also by Gargiulo-Sherman. Do not confuse this book with Reveal the Secrets of the Sacred Rose by Steven Culbert, which is even sometimes sold with the deck. According to Gargiulo-Sherman, it is not completely faithful to her intentions. To view more cards from the deck, click here. Illustration (above): The World from The Sacred Rose Tarot (copyright © 1980 U.S. Games Systems). Click the image for a larger one. The guide continues with more about decks . . . click here.